In a historic conversation, Timothy Geithner, Ben Bernanke and Henry Paulson talk about how they lost the country when they saved the economy. Where did he come from? Academia. Before being appointed to the Federal Reserve’s Board of Governors, he taught economics at Stanford and Princeton. Where is he now? After he left the Federal Reserve, Bernanke wrote a book called “The Courage to Act: A Memoir of a Crisis and Its Aftermath.” Both he and his successor at the Fed, Janet Yellen, are currently distinguished fellows at the Brookings Institution. He is often criticized for … not seeing the crisis coming and for bailing out the banks. His main role? Pushing through TARP, an unprecedented government bailout of troubled financial institutions. Paulson also oversaw the government takeover of Fannie Mae and Freddie Mac in 2008. When he asked a reluctant U.S. Congress to give him that power, Paulson insisted that the mere possibility of a takeover would be enough to increase confidence and stabilize the markets. He famously said: “If you've got a bazooka, and people know you've got it, you may not have to take it out.” In the end, he had to take out the bazooka. Where did he come from? Goldman Sachs, where he had worked since 1974. As the bank’s CEO, he earned $38 million in 2005. Where is he now? He, too, made sure to put his version of the events on paper and wrote a book called “On the Brink: Inside the Race to Stop the Collapse of the Global Financial System.” In 2011, he launched The Paulson Institute, a “think and do” tank whose mission is to strengthen U.S.-China relations. He is often criticized for … being too close to the banks. Many critics say that it was a conflict of interest to have a former Goldman CEO help design bank bailouts. His main role? Regulating Wall street as the president of the New York Fed. Designing “stress tests” to determine whether a bank has a plan and enough capital to weather another crisis. Geithner also tried and failed to save Lehman Brothers and brokered the initial $85 billion dollar deal to bail out AIG. In the end, the U.S. government ended up spending $182 billion to help stabilize AIG. “Most financial crises are caused by a mix of stupidity and greed and recklessness and risk-taking and hope,” he said in 2012. Where did he come from? For the most part, the U.S. government. He spent much of his career working for the international affairs department of the Treasury. Where is he now? Like Bernanke and Paulson, Geithner wanted his own version of the events to get out there and he wrote a book called “Stress Test: Reflections on Financial Crises.” He now serves as president of Warburg Pincus, a private equity firm. He is often criticized for … bailing out AIG. Criticism intensified when the bank announced that it would spend $165 million on executive bonuses for the same people who brought it to the brink of collapse. | Your browser does not support the audio format. "We were dealing with trying to put out a fire without the right tools to do so." 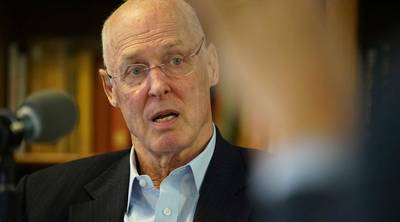 That’s former Treasury Secretary Henry Paulson describing how he, Timothy Geithner, former president of the New York Federal Reserve and former Treasury secretary, and Ben Bernanke, former Federal Reserve chair, were insufficiently armed to deal with the 2008 financial crisis. The three men worked together to coordinate an unprecedented response, often racing to do so against the clock and against public opinion. Marketplace host Kai Ryssdal interviewed the three men March 13 in New Haven, Connecticut, about what happened, their biggest regrets and our ability to fight the next financial crisis. The following edited transcript of their conversation is part of our Divided Decade project covering the 10-year anniversary of the financial crisis. Ryssdal: You've just come from a conference of your peers and colleagues at this time 10 years ago. You actually made a little joke and you said, it was Tim, you said it was a little post-traumatic stress being in this same room with these guys 10 years later. What was it like to be in there hashing it out? Geithner: Yeah, I think we all had a little PTSD, maybe not as much as the country has, but it was, what we tried to do is bring our former colleagues together and look back at the choices we made, and the things we did, and options we had, and how things turned out. What lessons we could take from that, and in some ways, it was terrific because it reminded us in some ways of how lucky we were and the quality of our colleagues and what we what we tried to do, what we were able to in some ways, because they're just a terrifically talented group of people, and they demonstrated, like, all the things you'd in many ways you would like to see in government, which is, you know, a focus on evidence on substance and what works and a willingness to work together, not fight over turf and tribal stuff too much, although there was some of that. Ryssdal: Well, yeah, there was some of that and we're going to get to that. Hank, let me ask you this: Did you like what you saw when you look back 10 years later? Paulson: Well, in terms of that the group we had together, I liked what we saw a lot because this was a stressful period for all of us. We all of us know we need to be mindful of what the American people went through and the trauma, the economic burden particularly that was borne by those that were most vulnerable. But the people that we had working with us, you know, for me, you know, just knowing that I, you know, was able to work with people as outstanding as Tim and Ben and then have the group of people we had working with us what was amazing because the issues that you deal with, it's not just a matter of figuring out what the right solution is. It's how do you get it done? And that comes down to people and how people work together. And that was what was a positive, all of it. Bernanke: And we had Republicans and Democrats, because a lot of the crisis, the worst part of the crisis took place in the transition from President Bush to President Obama. Hank, of course, was the Treasury secretary for the last months of the Bush administration. Tim was coming in. And the Fed was trying to bridge that time period. And, you know, there was a tremendous amount of cooperation between the incoming and outgoing administrations, which proved, I think, very helpful. Ryssdal: Let me start the substantive part of this with Bear Stearns weekend. Ten years ago, basically this week. The Fed's role in it providing the backstop for the Bear assets to let JPMorgan come in and do it. One of the things that has become paradigmatic through this entire 10 years is the way the Fed's role changed. I want to ask you about your misgivings in Bear weekend, knowing you were going to have to lean in and start doing things the Fed had never done before using extraordinary authority. Bernanke: Well, I was of course, you know, reluctant to invoke powers that hadn't been used for many years, and I was worried about the political backlash, the effects on the Federal Reserve. But it was a decision the three of us made, and I felt very comfortable with the decision that if Bear Stearns had failed in a uncontrolled way that it would have reverberated throughout the financial system, caused a lot of damage and probably brought the financial crisis forward by at least six months. Ryssdal: I wonder whether you would agree with this statement, all three of you, that Bear Stearns was the moment people really started paying attention. You guys had been living with this for a long time, 18 months, two years, knowing. All of you say in your books you knew it was coming. Do you think people really, it focused people's minds, Hank? Paulson: — those big mortgage giants with $5.4 trillion in securities. So I think that the, we would have had something that would have been an order of magnitude more difficult if we hadn't taken that action. Ryssdal: I want to get to all that sequentially, because the order in which these things happened, it's clear now, 10 years later, really matters, right? But I want to ask you, Tim, something that you say in your book, that you had a history of working with economic crises. This is what you did in the Treasury your first go round. You say you know what a crisis and a panic smell like. What does a crisis smell like? Geithner: It's hard to describe that. In some ways, what it was really like in terms of the panic, but, you know, you could hear it in people's voices when they talk to you. You know, if you talk to people in the financial system around the world at that time, people who were, you know, like in a relatively enviable position: strong, competent, smart, experienced people, you could hear in their voices for the first time in my lifetime a level of fear about the existential risk to the country, to the system, that I don't know how to capture it beyond that. Geithner: It came later, it came later. Yeah, I think just one thing about your point, you know, this thing really, the run really began the summer of '07. Ryssdal: Oh, sure it did, absolutely. Geithner: Yeah, and he, you know, you just kind of hear it in his voice. And we we talked about what we had to talk about, then we got off the phone, and I called him back and I said, "Don't let anybody else hear that in your voice. Don't get on the phone with anybody else until you get that sense of fear and anxiety out of your voice." Paulson: I got out and made some calls, and I remember getting Joe Ackerman, who was the chairman and CEO of Deutsche Bank, and he was in New York City when I found him and got him on the phone to see if they might have any interest in investing in Bear Stearns, and buying Bear Stearns, and boy, the fear in his voice. And he said, "Oh, my gosh. Buy them? No. The question is, why should I do anything with any U.S. investment bank?" So there's no doubt about it. And this had been rippling on for some time. Ryssdal: Ben, go ahead, you were going to say something? Bernanke: No, I was just going to say that, you know, a panic is an emotional state, but it's also an observable thing, which is money running away. Nobody wants to lend money on a short-term basis. And in Bear Stearns' case, their short-term borrowing, the short-term funding was just running, and it was clear that that if we didn't arrest that situation, it was going to spread to other companies as well. Ryssdal: I don't want to get too deep into the nuts and bolts of this thing, but all three of you talk about the short-term lending market, repo and overnight and how critical all that was and how that just vaporized. And I wonder if we were set up by our very financial infrastructure to have this happen. Paulson: Well, you've made the key point, which is, the key point is, we had a financial infrastructure that had been put in place years earlier, and then we'd had a financial system that had developed and really outgrown the regulatory authorities we needed to to manage it. We didn't have the transparency you needed into the system. It was incredibly complex. We had a huge securitization market. We had a very big use at the repo market, which I would describe as a secured interbank lending market, which was several trillion dollars. It had big money fund markets. And so this was clearly a case where we had a balkanized, outdated regulatory system. And so that's what we were dealing with throughout this thing. We were dealing with trying to put out a fire without the right tools to do so. Ryssdal: Is it possible though that, and you specifically talk a lot about what you were and weren't allowed to do. Actually, all three of you do. But is it possible that you were able to react on the fly so much and in essence wing it because everything was so balkanized and because of the state of urgency? No? Tim, you're not having that. Geithner: Until President Bush and Hank Paulson were successful in getting Congress to pass emergency authority in September, early October, we were using duct tape and string to try to hold the thing together. We were doing so creatively in ways that hadn't been done since the Great Depression. But those tools were very weak, and the capacity to maximize our power was very limited against the force of the storm. When we, when they were successful in getting more authority for the country and to protect the country from the failing financial system, at that point we were able to do really extraordinary dramatic things. And I think that the absence of those tools at the beginning and the degrees of freedom we had and the relative balkanization of the authorities was a major factor in why this crisis was so bad and why the damage to the economy was so great. I think it was a terrible handicap going into this. Paulson: And getting back to what Ben said, the apex of the crisis or the most virulent form of the crisis hit on the margins of a national election. So it was a clash between politics and economics. But one of the things that Tim got to here was we all knew quite early on we would like to have authorities to do things we didn't have. So the question was, how did you get those from Congress? So what can we do to get those authorities from Congress? And we started working on reforming Fannie Mae and Freddie Mac in the fall of 2006. We had plans to go to Congress and get authorities when we could, but we knew that the worst thing we could do would go to Congress and scream, "We have a national emergency, and if we don't get these, the whole system was going to collapse, this could be a catastrophe," and then not get them. And so frankly, the first time we, I don't think any of us believe we had any chance of getting the authorities any earlier than we got them. But that was sort of what we're living with, working with the authorities we had, inadequate as they were, and making do with them to sort of hold the system together until we could get to Congress and get the authorities we needed. Ryssdal: Ben, you make a point of wanting to stay out of the politics of this thing to preserve the Fed's independence, but you spent no small amount of time schlepping up to the Hill and talking to Congress members and laying stuff out for them. Bernanke: Well, that's part of the accountability. The Federal Reserve is a government agency. It is acting on behalf of the people. Its leadership, including me, is appointed by the president, confirmed by the Senate, but is not elected. And so it is very important that we do all we could to explain what we were doing, why we were doing it, not only because of democratic accountability, as important as that is, but also to try to allay the fear to some extent and try to convince people that we were, in fact, responding to the situation. Ryssdal: When do you think Congress started to hear you on that? 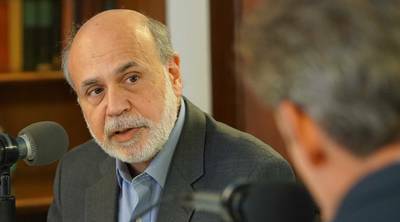 Bernanke: Well, they, you know, they certainly responded to Bear Stearns. Ryssdal: Hank, you're laughing, what? Bernanke: Well, it took a while. I mean, I think the most important early success, and Hank can speak to it, was Hank's ability to get the ability to respond to the Fannie and Freddie situation. Ryssdal: And so that's, that's what we call a great cue in radio. I'm going to play you a piece of tape, Hank, and then I want to talk to you about it. Paulson tape: If you've got a squirt gun in your pocket, you may have to take it out. If you've got a bazooka and people know you've got it, you may not have to take it out. You're not likely to take it out. Ryssdal: So Hank's laughing and Tim's kind of smiling and going, "Yeah." So this is you in front of Congress July 2008 saying, listen, Fannie Mae and Freddie Mac are structural and systemic problems. Ryssdal: You guys are smiling as he's talking. Paulson: — if you've got unspecified authorities, you won't have to use them. But so when the situation changed and of course Congress hadn't, Congress only gave us the authority to act to put capital in terms that Fannie and Freddie accepted. So what we did was something that Congress hadn't contemplated. We got the ability to have a safety and soundness regulator for the Fed, excuse me, for Fannie and Freddie, could make the kinds of judgments regulators normally make and to have the Fed also be a consultative regulator. And so we changed and reversed, reversed course. Ryssdal: You opened your book, though, in the recounting of this whole thing, with you telling President Bush you're going to do it and they're not going to know what's coming. The first inkling they're going to have is when their heads hit the floor. Paulson: Yes. Now, remember, I told President Bush I was going to do it weeks, weeks after we got the authorities, so I went to Congress in July and we, we got those authorities I think, like, the middle of July. Then what happened was the Fed got in and took a look at them. We had Morgan Stanley come in and take a look. We got all the information we needed. We learned, holy cow, the problem is much worse than we thought it is. There is a big hole, and on top of that, their regulator had had very recently asserted that they were well capitalized. So now we were in a position where we knew we had to take them by surprise because the CEOs have fiduciary obligations. If you go to them say, "Let us tell you what we're going to do. We're going to have the government take over, wipe out the shareholders." They wouldn't want that. Geithner: I was going to say, you know, it just illustrates something important people understand, which is these things happen, they can happen really quickly. They're very hard to understand in a moment. There's huge fog, uncertainty around them. You need the ability to adapt and move quickly and to change your mind. And although bazooka may not be the, I mean another thing about these, about runs like this is to stop a panic, protect people from a panic, you have to have, be able to deploy a level of force that is dramatically large relative to the problem so you can reassure people that if they stay and don't run they'll be safe and that kind of thing. Ryssdal: So you know what's interesting about this whole exchange is that the throughline of your recounting of this in your book is very heavy on the war metaphors and how you three, but you specifically, thought you were at war. And there's a great scene where you go to see "Hurt Locker," and you now finally have somebody who you can identify with, and that's what it felt like defusing these bombs. If you were at war, who was the enemy? Geithner: Good, subtle question. The enemy was the was the fear and the loss of confidence and the sense of no bottom, no foundation, and the enemy was the perception that the safest thing you could do as a depositor in a bank or as a lender to somebody or as a businessman or something that, is to rush rush for the exits to protect yourself against the harm to come. And the collective that's maybe rational individually, but the way panics work is the collective damage that rational behavior causes is the deep existential threat to the country. And so the scary thing is to figure out how you break that spiral, how you can alter the incentives, how you convince people that we can put a floor under things, it won't erode beneath them, we can pull the thing back from the abyss so they can get back to the business of, you know, trying to make their business work and hire people. Ryssdal: To that end though, Hank, I'll get you in a minute. Go ahead. Ryssdal: Economic wartime, to be clear. Paulson: — economic. So that's my point. So that's a big distinction. And so he would say to me, "You know, you guys are wartime general. I'm looking at you as wartime general. I'm going to delegate a lot, but staying in regular contact with you." Now we recognize we weren't landing at Omaha Beach with bullets flying overhead. But when we talked about this, and so George Bush would talk about this, and we would talk about it among ourselves. Who was enemy? We always used with him I would always use "Butch Cassidy and the Sundance Kid," you know, that, you know, who are these guys? You know, they just keep coming. And he would always say, "Is this enough dynamite? You know, is there enough force to stop this?" After every time. Ryssdal: Doesn't survive contact with the enemy. Bernanke: — as soon as you meet the enemy, and that's essentially where we were. We had all kinds of plans and white papers and memos and then, of course, that week had contact with this enemy and those plans needed very radical rapid revision. Ryssdal: So we get to Lehman weekend. You've been through Bear Stearns. Fannie Mae and Freddie Mac have in theory been taken care of. Things are going OK. And then Lehman Brothers comes up. Paulson: Let's go back to Fannie and Freddie because this is, I'm going to accentuate a point that Tim made. During a crisis, what happens is the market gets very quickly to where the most panicked investor gets. And so a good example, so Fannie and Freddie, there was a short time there where I sat in my office, looked out at the Washington Monument, and my eyes actually moistened, and I said, "We may have put out this fire. You know, this may have been the dynamite we needed." I mean, what a strong statement, coming in, nationalizing Fannie and Freddie, mortgages are ground zero of, you know, the crisis, government stands behind it, help all the financial institutions. The market instead looked at it and said, "Holy cow, if Fannie or Freddie has got all those bad mortgages, just think how bad Lehman might be." And so it, that's just what happens with these things sometimes, the things you're doing that you think are going to knock it out, you just even accelerate it. That's why it takes a lot of tools to deal with these. Ryssdal: We get to Lehman weekend, you two holed up in the New York Fed with bank CEOs trying to find a buyer. There isn't one. The Fed is not in the room in this conversation, right, because, so you don't have that Bear Stearns we're going to guarantee some of these assets thing going on. The No. 1 question I get, and I'm sure you three get as well, when I go out and do things — we actually asked our listeners for what they want to ask you three — No. 1 is actually, No. 1 is why didn't anybody go to jail? Which we'll get to in a minute. But No. 2 is why did you let Lehman Brothers fail? Tim, you're close to the mic, lean in. Geithner: Lehman was terribly weak, even relative to the other weaker institutions in this context. The world was terrifically fragile. Very hard to find someone strong enough in that moment of peril that was going to be capable of taking on the vast bulk of that risk like JPMorgan did in the Bear Stearns context, and the tools we had at the Fed was given, you know, given by Congress to deal with these things were very limited and really we're not effective and practical and valuable in preventing the failure of a weak, failing investment bank. The important thing about Bear in this context is in many ways, people looked at what we were able to do that weekend, and they, many people find it reassuring. Ryssdal: During Bear. Yeah, totally. Geithner: I think we found it the opposite. Because we knew that, we knew that our ability to help prevent that devastating failure was totally dependent on there being someone large enough and strong enough who could absorb them, and we could help induce that to happen. But our tools were more limited than many people thought in that context and going back, coming into Lehman weekend, we were left with those same tools, no better options. Ryssdal: But that's kind of my point, right? Because you did Bear and it worked because of all the factors. Right? There was a buyer. There were guaranty assets the Fed could actually have collateral to lend against. I wonder if, well, did you set yourselves up to fail with Lehman because Bear Stearns worked out in theory so well? Paulson: The point I tried to make early on, which I think is just the opposite, OK, I think that if we had had Bear Stearns go down, we would have had shortly thereafter, you know, Lehman go down. We would not have — can you imagine if we had not nationalized Fannie or Freddie first, $5.4 trillion in assets, nine times bigger than Lehman — it hadn't stabilized that. So part of the story I would add on was after, after the Bear rescue, Ben and I went and talked with Barney Frank at the House Financial Services Committee, and Barney's memory is the same as ours. We went up there, and we said, "You know, we learned something, Barney. We don't have the powers, the emergency powers in our regulatory system, dealing with a failing nonbank." And when an investment bank starts to go, in the middle of a run it disintegrates very quickly if you don't have the emergency power to guarantee or to put in capital, so we need some kind of emergency resolution authority. Bernanke: So with Bear Stearns, I very well remember the conversation. I was on my cell phone getting out to the car in the morning and Tim and Hank were on the phone, and we were saying, "You know, here's how we could do it. Should we do it or not? What are the pros what are the cons?" And we decided, OK, it's a go. We're going to do it. So we agreed to do it. We never had that conversation with Lehman because we never had a viable option. There were three ways in which we helped save firms. One was to have a buyer. And we thought we had a buyer, but we had both Bank of America and Barclays, both of those failed. Second way was to inject capital, which is what we did after the [Troubled Asset Relief Program]. But TARP didn't come until October, which was, of course, after Lehman. The third way was temporary loans. But there you've got to have a company which is fundamentally viable and just short liquidity. And Lehman was not viable. And so that strategy didn't work. So we didn't, you know, we didn't really, it wasn't a choice. We didn't have tools to prevent it. Paulson: And what Barney Frank said to Ben and me when we met up with, Barney said to Ben and me when I went up to see him, he said we can't get you the emergency loan authority unless you come to Congress and scream and yell and say, "If we don't get it, Lehman is going to fail and we're going to have a disaster." Maybe even though we can't. Of course, if we did that, Lehman would have gone down the next day. Ryssdal: Do you think it took Lehman to get you guys TARP? Is that, do you think that is true? Paulson: Well, that's a gross, that's an oversimplification, but I will say this about Lehman weekend to put it in perspective: We had three institutions going down at the same time. We had Lehman, AIG and we had Merrill Lynch. OK. Now it turns out, we had one buyer. So we are unhappy that we were having trouble getting BofA to buy Lehman. But I tell you if BofA had bought Lehman, then they wouldn't have bought Merrill Lynch, and there would have been a bigger failure, and it would have been worse. And I will say that one thing the Lehman shock did was energized the system politically, and that was what it, what it ended up taking for us to get these emergency authorities to let us to recapitalize the whole financial system and avoid a catastrophe. So as bad as Lehman was, and it was terrible, you know, this was not the worst alternative. We avoided worse alternatives. Ryssdal: And I think I'm quoting you, "When politics and the markets go head to head, the markets win." Paulson: I think that we all believe it. I use that quote in the book. But we all knew it, and we were watching it, so we weren't trying to convince ourselves, but the other, the other thing which we've all said is it takes a crisis to get Congress to act. So, you know, on the one hand we're all, we all look back and we say, "Well, the system worked" in one sense in that we got the emergency legislation we needed in Fannie or Freddie before there was disaster. The TARP was probably the last consequential bipartisan — not probably, was the last consequential bipartisan legislation that came from Congress. And it was done in 16 days. But it took an emergency to get them to act. And so that just shows you the dangerous situation a system is in when, if the regulators don't have the tools they need to work with and have to go to Congress to get them, what the cost to the economy could ultimately be. Geithner: It's not the best way to run a country, run a financial system, which is to require politicians to decide in the moment that they need a stronger fire station because the politics for the politicians are just terrible in this context and the risk is that they'll be late. And because they're late, the country will be left with much more damage than is necessary in that context. So this is a good illustration of the costs of going into, you know, financial systems are fragile and they're dangerous, they can cause a lot of damage. The defenses sometimes fail even if the defenses are terrific, they sometimes fail over time. They need to be complemented by a stronger set of tools that the firefighters can use without being subject to the potentially devastating costs of the rational politicians saying, "I can't vote for that. There's no way I'm going to go for that." Now things will change when it's obvious to hundreds of millions people that you're at the edge of the abyss. But why would you want to let it get that late? Ryssdal: But to that point, Tim, you actually say in the book and you said since, you know, "We saved the economy but we lost the country," right? And you three specifically went out there and were saying reassuring things because you kind of had to, because had you said the truth, it would have been catastrophic. But I wonder if it would have been easier for you to do your jobs had the public been more informed about the reality and more aware of their economy. You're nodding. Paulson: It would have been. But the challenge, and this is of all the things, I think when we've talked about it, all three of us which, that we could have done a better job of communicating. I look at it and I look and say, "You know, I really wish I was able to help the American people understand that what we were doing wasn't for Wall Street. It was to protect the financial system for them." Ryssdal: Yeah, but Hank, but wait. Because every time you went up to Congress, people in Congress, the Democrats usually would say, "We need mortgage relief, and we need to help everybody." And you led the charge in "We have to save Wall Street," full stop. So, so make that connection for me. Paulson: Here here's a connection I will make. OK. If I had to decide, was forced to decide between reassuring the markets and getting, having market stability, OK, and telling the public what they wanted to hear, I opted on market stability because I thought that was protecting the public. And I really did. And so the fact was I wish I could have done a better job of both, but I'll give you one prime example. OK. So it's the best example I can think of. So let's take putting capital into banks. OK. The public wanted and understandably wanted to see the banks punished. OK. And I understand why. They wanted to see the banks be held accountable and they wanted to see there be, you know, tough compensation restrictions. And if we went the way we normally do, if we'd done what the Europeans had done, and what almost anyone else would do in a crisis, and what we did when we nationalized, you wait until an institution is getting ready to fail. And when they're desperate and otherwise and then you nationalize them and you nationalize them with punitive terms, and if you do that, you are able to put capital into a handful of institutions. But we did something that was very novel, worked very well economically and was politically a disaster. Because what we did was we designed a system that let us move with lightning speed. We capitalized 700 banks. But if we put conditions on that capital, we put conditions on it, banks wouldn't have taken their capital until they were getting ready to fail. Ryssdal: So let's remind people what this was, right? You passed TARP. We get a whole bunch of money. You sit down with the big Wall Street banks and instead of the original plan, which was to buy the bad mortgage assets off their books, you sit them down and you say here's billions and billions of dollars, you're going to take it. And that's going to be more effective and efficient, right? So that was the efficiency play from the markets guy, which you were in this trio, right? Paulson: I would say I was a markets guy, but I think all of us were part of this, and we all believed that what we did — and I think the United States of America benefited big time from the fact that we, with lightning speed, recapitalized 700 banks. And you look at the way our financial system came back, you know, beginning, you know, growing at 2 percent from October of 2009, deleveraging. You compare that with what has historically been done, to compare it with the Europeans that said, "We're going to punish our banks and do what the public wants to, and we're going to nationalize," and guess what? Two banks in London took capital because just before they were going down, a handful on the Continent. So we, what we tried to do was do something that was going to work for the American people. But I stand guilty of not being able to explain why the financial system was good for Americans. Ryssdal: So let me get the academic in on the conversation, because you say in your book when you and Hank Paulson started working together, it was an academic rigor meets street smarts. He's the street smarts. Ryssdal: You savvy Fed chairman, we know you so well. Explain then how what happened, how what was done after Lehman was actually helping the people on this account. Bernanke: Well, I was an academic researcher professor before I came to the Fed, and my research was very much focused on, you know, the importance of the financial system for the broader economy. And I was interested in economic history. I've done a lot of work on the Great Depression of the 1930s, and one of my very first papers as a young academic argued that one of the reasons the Depression was so deep and so long was because the financial system collapsed, the banks closed, banks are closed or alternatively almost near failure. They can't lend. The lack of credit has tremendously bad effects on the economy. And even looking across countries, you know, those countries in the 1930s where there were big bank failures and lots of banks closed their doors did much worse and were depressed much longer. So I think putting capital in the banking system and making it work again, making it viable so that it can provide credit, was essential, I think. It was really, I think it was absolutely the right decision, and it meant the U.S. economy recovered quicker and our banking system recovered quicker, and it was again about stabilizing the economy. Geithner: This is the central dilemma for policymakers in a crisis, which is that everybody's instinct is to let the thing burn, because it seems just to let it burn. It seems fair. Good for future incentives, good for moral hazard. Better at preventing future crises. But if you let the thing burn to the point the system collapses, you're going to be left with hundreds of millions of innocent victims. And it is very hard for people to understand, completely understandably, that what feels unjust and immoral in the context of breaking a panic is the most just thing to do if your interest is trying to prevent the economy from mass unemployment or a decade of breadlines across the country like what happened in the Great Depression. And it's a it's a hard thing for people to appreciate or think in part because, you know, we hadn't had a major financial panic in 75 years. There was no living memory of what the risks were in letting a panic burn go too far. And that's in some ways, it's the central reason why these things are so terrible, because the natural human political instinct around fairness and justice collides with what is necessary and effective to protect the most people. Ryssdal: This is actually great because all three of you are leaning into the microphone because you want to climb in on that. Paulson: OK, Kai, I want to say one other thing that I think added to the confusion in all of this, which was that when we were designing a program, you know, we had all known how in the United States of America, government ownership is an anathema. There's a red line. And we all knew that putting capital would be a problem if it were drawn broadly. So, you know, I had argued and I really believed at the time that we could free up the banking and the interbank lending and free up capital by buying illiquid assets from the banks. OK. We had believed that. And if I had believed something different, I'm not sure we could have gotten TARP. I'm not sure the Republicans ever would have voted for it. But I, in good conscience, went forward, made the case. But then when we were up at Congress, and we'd seen the situation continue to get worse when we were up there. We'd seen two of the biggest bank failures in U.S. history with essentially WAMU and Wachovia going down and what happened in Europe. We needed to change. And I remember going to President Bush and saying, "You know, the situation changes, we're going to have to recapitalize the banks." And, I mean, he basically was very courageous. He said, "You got to do whatever you got to do to to save the economy." But it was, like, holy moly, you know, you've told the whole world you're going to buy illiquid assets. What do you do? I said, "Well, you know, we've got to change." And so we changed right there. The last thing I will say, and this isn't to justify the program or not, but you'd be surprised when I go and talk to average Americans and they're angry about not punishing the banks, many of them also believe we gave like $700 billion to Wall Street. They don't recognize that all the capital that went into the banks and in the insurance companies came back, plus almost $50 billion. Now that's not to justify or not justify it, but that's another source of confusion. Ryssdal: Ben, lean in here, you were going to say something. Bernanke: Well, I was going to say that prior to Lehman, there was a wide variety of views among economists about how serious a collapse of the financial system would be for the broader economy. And given my background studying depression, I was on one end of saying, no I think this is very serious. Ryssdal: Even within the Fed? Even within the Fed, as you sat in your meetings? Bernanke: Yeah, certainly among academic economists, anyway, I had a much more concerned viewpoint that I was again, because of my historical work, I thought that this could be very serious, and I went to Congress and I said if we allow the financial system to collapse, you know, unemployment is going to do this and so on. It turns out that even I, who was at the end of the most extreme among standard economic views, I underestimated the impact. So I think, you know, I think even though we were very, very concerned, I think, you know, as we saw after the fact, and we saw how quickly the economy deteriorated in the last part of 2008, you know, I think the stakes were even higher than we understood at the time. Paulson: And I had often said that I underestimated it, the problem, every step of the way, right up through Columbus weekend when we put capital in the banks, but it also said that, and there's plenty of mistakes, and we can talk about all the mistakes and we talked about the communication. But I've said that even if I'd been omniscient, I don't believe we could have got the big things much righter, because it took started working on Fannie and Freddie, you know, in 2006 in the fall, it took them getting ready to implode to get Congress to act. And on the TARP, you know, even in the darkest days of the crisis, the House voted it down the first time. So there are plenty of things, you know, I know I did wrong and plenty of communication mistakes and so on. But in terms of the very big things, the reason I'm able to look back and say we got, you know, fighting an epic crisis without the necessary tools, we got basically the big things right, was because we weren't afraid when we made mistakes to correct it right there on the battlefield. Ryssdal: Mistakes aside, as you sit here 10 years later, what are your regrets? What did you do that maybe hasn't worked out 10 years later like you thought it would. Tim? Geithner: I think the three big things. There's many of them. I think three big things are we, as a country, allowed the financial system to outgrow the protections we put in place after the Great Depression and leave ourselves on the eve of the crisis with a very fragile, dangerous system. The second thing is that we went into the crisis, we've said, with very weak tools for protecting the country from a panic. It took a long time, and it took too long, and it took too much damage to remedy that failure. And although with that authority, you know, we did a set of very innovative, very powerful things and I think produced dramatically better results than is true for most countries caught up in financial crises. You know, we are still left with a terribly damaged economy, deep scars, huge loss of confidence in public institutions. And, you know, we didn't, the country got caught up in a little fever of austerity too prematurely. Ryssdal: Fever of austerity, yeah, went through that. 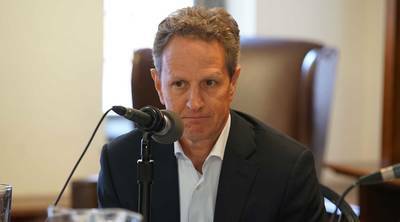 Geithner: We put on the brakes a little too early. You know, these things take a long time to come out of and repair. Recoveries after a financial crisis are very slow and weak and fragile. You need to err on the side of doing more longer than you think if you're going to, you know, improve the odds of getting back to some better place. So we let the system outgrow its protections. We went in with very weak tools, which made us a little late in escalating. And we, you know, we put our foot on the brakes a little too early. Ryssdal: Hank, regrets? Things that maybe you look back and you're, like, "That was an unintended consequence"? Paulson: You know, I know I can be pretty self-critical, so I can think of all kinds of things I'd said I wish I'd said differently. But the biggest regret I've got is that the life is going to be much more difficult for any regulator sitting in the seats facing another crisis because what we did was so unpopular. And, you know, I remember in 2009, in many ways the hardest thing for me, as tough as it was during the crisis, in the crisis, you know, you're playing offense, and so you really don't have a lot of time to be scared or to feel sorry for yourself. But I remember, you know, after the crisis, you know, all the criticism and then seeing — I don't know how I read the poll right. But there was a poll that came out, and as I read it, you know, that the TARP was, you know, less popular than torture. And so I looked at it and said we'd work so hard, we done something that had pulled the country back, I think, from the abyss, but I realize you're never going to get credit for, you know, preventing a crisis that people don't see. And the fact that we never were able to, and I never was able to make the connection between what it is this financial system does for the average American, and if the system doesn't work, how that's going to impact the average American and that we weren't doing this for Wall Street. So that's to me my biggest regret by far. Bernanke: Well, I didn't foresee the panic. I mean, I didn't appreciate that the problems in the mortgage market, the subprime market, were going to cause a loss of confidence in the broad financial system and lead to a panic. Now I think if I had foreseen it, I would have had more credibility. But I don't think I could have, you know, materially averted what actually happened. I think in terms of things that I could have done differently, I agree with Hank that, you know, we were so focused, I remember trying to deal with some of these situation — it felt like a one-arm juggler with so many balls in the air and trying to focus on my daily tasks and the challenges. And you know, again the communication, trying to help people understand against their instincts that, you know, allowing the banking system to collapse was not going to be something that would be irrelevant to their lives, that it was going to have an effect on, you know, on jobs, on mortgages, on incomes in a really big way. And the history of financial crises, a graduate school classmate of mine, Ken Rogoff, Rogoff and Reinhart, wrote this book, "This Time Is Different," about, you know, the history of financial crises, and they are very consequential and have big impacts on the economy. And, you know, I don't know, I made efforts, I went on television, I went on "60 Minutes" and various things to try to explain why we were doing what we were doing and how I, as an academic, had no particular connection to Wall Street, for example. But obviously, we didn't, you know, we didn't make that case. And it was difficult. Ryssdal: There was a scene at a dinner party some colleague of yours' wife said, "Oh, you're going back to Goldman." Right? You're smiling, but not really. Geithner: I mean, you know, everything that you have to do in a crisis is going to be vulnerable to being characterized as looking like you're just you're aiding the arsonist. And it, I think, understandably, the normal human looked at this stuff and said, "Gee, why was that fair? Why was that necessary? How does that protect me?" And the fact that people had the sense that I was like the third person to run Treasury from Goldman, I think, added to that perspective. Bernanke: But clarify, you did not [work at Goldman Sachs]. Geithner: That is true. Right. I mean, a lot of people thought the New York Fed was Wall Street, indistinguishable from them. Ryssdal: So has, did this episode — and I'd like to actually get all three of you to answer this one individually — did this change the way you think about this country, this economy, at all, how we've changed in the past 10 years? Geithner: I was going to say, I think, you know, this is a dark thing and did just terrible damage. But we were in many ways a really lucky country, because we went into this with a lot of financial resources, certainly large enough to deal with the problem, and we had, even though it took place at this really dangerous political transition between two administrations of different parties, we had two presidents who were overwhelmingly focused on trying to figure out how to do the right thing and not to exploit it for political advantage against the other. And, you know, we were very lucky in our colleagues. You know, we had a tremendously talented group of people who were trusted each other and willing to debate everything and go right at the hearts of — I love Hank's story, which is, you know, my general approach life is you see something hard, you run at it, not away from it. And, you know, we try to honor that basic strategy, and we were lucky, lucky to have those strengths as a country. Ryssdal: But did it change how you think about this economy? Geithner: You know, I think that, I remember having a conversation with the president, with President Obama before the election. When I first met him, I had never met him before. And he was, he said to me at one point, "I might need to ask you to come to Washington and work for me." And I said, "You shouldn't do that. That would be a mistake." And I had a long list reasons why that was the case. But one thing I said to him was that, "You know, we're the United States, we'll figure out to solve this crisis. And then you're going to be left with this whole vast array of other economic problems that are not my life's work. You need other people for those things." And I think that, what I think that, you know, you're, with the crisis behind us now, at least the financial crisis behind us, and a set of reforms that should make the system safer over time, we're back to confronting the damage caused by a deeply powerful set of long forces that were eroding the quality of life for the average American. You know, no income growth. Huge rising inequality. Deep anxiety about the future in that context. And I think the crisis made those things seem worse. But you're now finding people, you know, I think more open to trying and understand those and trying to think about what you do about them. Paulson: Yeah, I would want to just come back on something Tim said early on. I happen to think that one of the most important decisions President Obama did was picking Tim as Treasury secretary, because the policy continuity was amazing, and then Ben, you know, picking Ben for a second term. Those were very, very consequential decisions and made a big difference. Now in terms of the economy, one of the very first speeches I made as Treasury secretary in July of 2006 I think maybe surprised some people in the White House staff when I talked about income disparity and what we were seeing there. And I am, you know, one of the things that I'm thinking about a lot these days is, you know, that we have this economy that's growing at a fast rate, two and a half to maybe 3 percent, increasing all kinds of jobs. But it's not going to work for our democracy if we continue to have dysfunction in Washington and we don't figure out how to make this growth work for more Americans. Too many people are being left behind. And so you look at these structural changes that are going on, some of which are getting blamed on the crisis, when actually they predated the crisis and they were contributors to the crisis. When you look at automation and the impact on wages that's coming from that. When you look at the changing nature of work in America — by 2020, half of Americans won't be working for companies, they'll be self-employed. And so the policies we had used to work for this country aren't working as well. And so when — and the Americans know that their political system isn't working for them, that pushes them to push their politicians in political corners. And so to me, the economic issues are, you know, are the flip side of political issues. And so how to get our economy working for more Americans is the No. 1 question I have. Ryssdal: Same question to you, which is did this change the way you think about the economy? Bernanke: Well, before the crisis, I think there was at least some tendency to think that financial panics were something that happened in emerging markets or in grainy black and white, you know, films of people lining up in front of banks in the 1930s. And we found out we can have a big financial crisis even in advanced economy. Of course, this was a global crisis. It wasn't just the United States. Europe was also very badly hit. So that was certainly something we learned, although at some level, we understood that. But to reiterate, I think that part of the reason this was so damaging both economically and politically was because it came on top of some very disturbing trends. I gave a speech at the European Central Bank's annual conference last summer called "When Growth Is Not Enough" and pointed out that even with overall growth in GDP, that with median income, median wages not growing very fast, with inequality rising, with social mobility being more limited, that people, a lot of people are feeling pretty unhappy with the way the economy is going, and on top of that, we now get this very bad recession and the crisis. So obviously, there's a lot of reason for people to be unhappy with the environment. Geithner: Can I answer a different question, Kai, which is that I think the big effect it had on me, which is the obvious thing, which is just made me much more worried about the state of our political system and what has happened to the people's ability to govern, you know, to find basis for pragmatic compromise. And I think that the great strength of our country that in the crisis we were able to craft a relatively nonpartisan strategy to try to protect the country from much worse damage. But even at that time, you know, we were, we'd seen a substantial erosion, frankly, in the ability of the system, the political system, to deal with tough long-term challenges. And of course, that's eroded dramatically further, I think, since. And I think the economic challenges we face as a country, however daunting they are, I don't think are fundamentally about the absence of ideas or solutions that we think have some chance of being better than we live with, our challenge is getting those through a deeply damaged dysfunctional political system. Bernanke: Yeah, yeah. I also remember somebody in that same meeting, a Republican congressman, saying, you know, "Well, I hear what you're saying, but so far in our local community" back in wherever, he said, "we're not seeing any problems yet." And I said to him, "You will." And he did. Ryssdal: OK. So look, here's the deal, not to end it on a down note, but the throughline of a lot of this conversation and a lot of what you three have said in the last 10 years is that you were able to work together and have people believe you when you said it was dire. The problem is that we have to believe the people now. And do you think we are equipped to deal in the present environment with a crisis like this, or any crisis? Because there's another one coming. All three of you know there's another financial crisis coming. Paulson: You know, I'm going to try to take it to a higher level and say something. You know, I spent a lot of time outside of this country. I spent a lot of time in China. I spent time overseas. And despite our economic issues, we still are not only the biggest but the most diverse, the strongest economy in the world, and our young people are amazing in terms of their innovation, in terms of their creativity. And so the way I look at it is that there's a big "if, " but we have to fix our messes, and if we can fix our messes, I think — and we got plenty of time, we got time to do it before we lose our economic competitiveness — I think that the young people in this country are going to be able to accomplish amazing things. But we can't do that unless we have strong political leadership emerge. It's really, that's paramount. Ryssdal: What do you want people to take away from this conversation, which is another way of asking why did you three decide to do this? Tim? Geithner: I think what we're trying to do is to help people step into our shoes at that moment and get a better appreciation of what it takes to protect people from these things. Why is that important? It's important again because we're unlikely to have seen the last financial crisis. These things, the system is very fragile. Whatever you do, they tend to break. And it's important for people to understand that you don't want the defenses we built to erode, allow them to erode over time. And it would be better to go into the next thing with not just more degrees of freedom, but with some learning from the lessons we learned so that our successors can make better choices in the moment. You know, again, this is not the most important thing facing the country right now. The reforms we put in place are hugely important in making the system more stable, more resilient. But you should take advantage of a moment when in many ways, many other aspects of the economy are doing relatively well, to make sure you think about the, you know, the crisis next time. Paulson: I think we all believe that it's important that the American people understand what it is we've gone through so we minimize our chance of going through something like that again. Now you're right, crises are inevitable. No one's going to outlaw economic gravity. As long as you've got major economies, I don't care what the economic system is or what their political system is, you're going to have excesses. They're going to manifest themselves in the financial system, and you're going to have a crisis. Bankers will get usually all of the blame, and they deserve a lot of the blame, much of the blame. But the root cause are flawed government policies. So I think what's important for us is to have people not forget that, to recognize that although we can't prevent financial crises, we can expect to limit their damage by getting to the excesses before they are too great, and then having the tools to put out the fire sooner and meeting them with with real force. So again, we're certainly not here taking victory laps. None of us feel that, but we really think this is going to be a huge mistake if people don't take the right lessons from this and do everything we can to minimize going through something as horrific as we went through. Ryssdal: Ben, last word to you. Bernanke: Well, you asked if the system is safer. I think it is safer. I think the reforms were, on the whole, quite constructive. The banking system is stronger, oversight is better. The tools are mostly better, although some of the tools we used during the crisis were taken away. So it's not an unambiguous improvement, but overall I think the system is stronger. But the enemy is forgetting that as time passes and the memory of this gets further in the rear-view mirror, you know, then you'll start hearing from Congress and from the banks, you know, well, this is going to constrain lending, we should really start undoing all of these things as soon as possible. Ryssdal: Which we're hearing today. Bernanke: A little bit so far, not too bad, but I think it is important that we don't forget, that we remember that financial crises do happen. I'm not that fatalistic. I don't think the big ones necessarily have to happen all that often. But when they do happen, you want to be prepared. You want to have the tools and you want to have a system which is strong enough to withstand the kinds of shocks which normally occur. Paulson: And we all — although we all agree the system is safer and we're much better off in that regard, I think all of us also believe we'd be better off if we had some stronger tools. OK, they've taken away the ability to guarantee liabilities that we use for money market funds. The guarantee that the FDIC had for the unsecured liabilities of bank holding companies. They've taken away some of the Fed's, you know, emergency lending on a one-off basis. And so although I totally agree with what Ben says about the system being net net safer, I, for one, am not relaxed about the fact that whoever succeeds us if and when there is another epic crisis, I believe we're going to have to go back to Congress and get tools that they don't have to be able to meet this with the kind of force it takes to limit the damage. Ryssdal: I'm going to let you guys get on the road. Thanks for taking the time. As a non-profit news organization, Marketplace is on a mission: to raise the level of economic intelligence across the country. Listeners like you who give to Marketplace do more than help keep the show on the air – you help us grow and get better. Contribute now to support independent, public service journalism you value and trust, and thanks for investing in what we do.